Who is Jermaine the Dog? Finn and Jake’s brother has been mentioned a few times on Adventure Time, but the show has never spent much time with him until this week’s episode, which reveals why Jermaine hasn’t been a part of his siblings’ lives. That’s because he’s been spending all of his time protecting his parents’ home and assorted magical artifacts from demons that want to reclaim what Joshua took from them years ago. 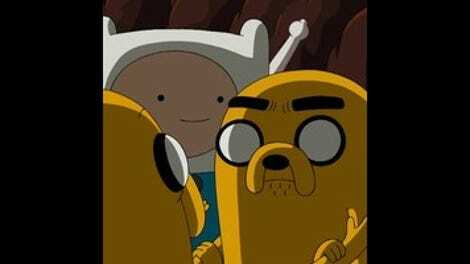 And he resents Finn and Jake for living a life of their own while he’s been stuck in their childhood home. Jermaine is the normal brother. He’s not the abandoned human son of a space criminal like Finn. He’s not the side effect of an extra-dimensional demon bite like Jake. He’s just a dog living in his dead parents’ house, watching over his dead parents’ things, and he does a really good job at it for no reward. That’s because he’s responsible and has a system, a system that works because there aren’t X-factor like Finn and Jake around to mess it up. And because Finn and Jake aren’t around, Jermaine hasn’t had any opportunities to act on his angry feelings toward his brothers. When Jake and Jermaine meet up in their dreams, Jake is convinced that it’s time he and Finn pay their sibling a visit. 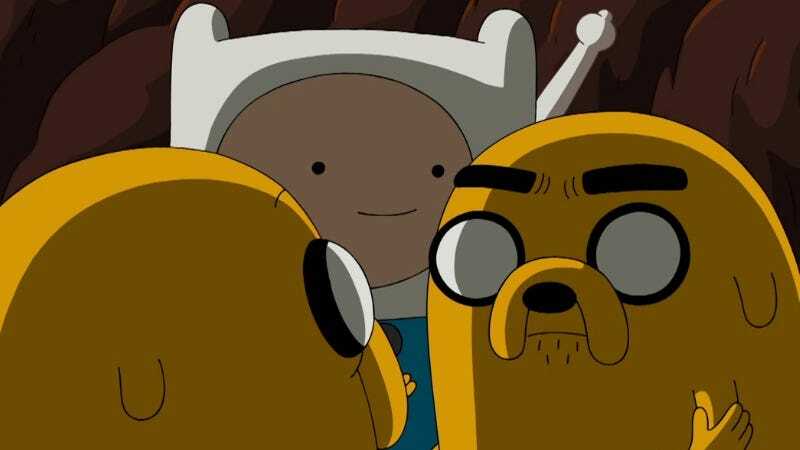 Jermaine invites them into the house, which is surrounded by a ring of salt to keep the demons out, but he immediately regrets his decision when Finn and Jake introduce disorder to Jermaine’s tight system. Finn regresses back into a hyperjuvenile personality when he enters the home he grew up in, and Jake puts them all at risk by using some of the salt from the outside ring in his fried rice, which allows the demons to make their attack. I didn’t win! When do I win? Special Guys One and Two win every day! Crackin’ jokes, readin’ foodie mags in your tree-town funhouse. Must be nice to be so special you can go off and find your own fancy ways. Meanwhile, I gotta stay here and watch dad’s trashy booty ’cause I never stretched into the sky and farted on the wings of a falcon, I guess! Tom Scharpling delivers the speech with great intensity, although it’s hard not to imagine Scharpling’s Steven Universe character, Greg, as a dog whenever Jermaine speaks. There’s a similar quality to Scharpling and John DiMaggio’s voices that reinforces a brotherly bond between the characters, which makes Jermaine’s big breakdown all the more effective. Jermaine resents Jake more than he does Finn because he has more in common with Jake, and he believes that Jake’s extraordinary abilities garnered him more love from their parents. The reason Jermaine has created all this drama is because he’s been stuck in this house alone with only relics and memories of the past. (Bryce and Booboo Sousa don’t count as company.) He hasn’t been able to forge a new life outside of his father’s home and his father’s shadow, creating a cage for himself by staying tethered to his place while his brothers pursued the vast opportunities of the larger world. But Jake tells Jermaine that he doesn’t have to stay here. This is the life he has chosen for himself, and he can choose a different one. Having finally expressed his emotions, Jermaine is able to see clearly for the first time, and when he looks at his father’s home going up in flames, he sees a bright future for himself. The metaphor in this episode is pretty easy to sort out: sometimes you have to let go of physical reminders of the past in order to truly move forward. As long as Jermaine keeps himself locked in that home, the demons will continue to surround it, with the demons representing his ill feelings toward the brothers that abandoned him and left him with all the responsibility. By letting the home burn to the ground, along with all the artifacts, Jermaine is able to expel those demons from his life, and finally pave his own path for himself. “Jermaine” is written and storyboarded by Adventure Time regular Jesse Moynihan and Brandon Graham, an exciting new voice for this series that, like many of exciting new voices this season, comes from the world of alternative comics. I’m a huge fan of Graham’s comic-book work, which is full of big ideas, meticulous world-building, and dynamic action presented with a distinct visual style and smooth sense of humor. As a writer and sometimes artist on Image’s Prophet, Graham tells self-contained sci-fi stories that connect to create a sprawling epic about the future of Earth and interplanetary colonialism. As the cartoonist of books like King City and Multiple Warheads, Graham exhibits a talent for rich character and environment design and a sharp wit that shines through in his wordplay and sight gags. The combination of all these skills makes him a perfect creator to add to the Adventure Time team, and “Jermaine” is a very strong first outing that leaves me eager to see more of Graham in this universe. That face mug is very cool. And the flying shoe gag is very funny. I would love to see Brandon Graham become a regular prop designer on this show, but he’s plenty busy with his own comic work. Speaking of Graham’s comic work, he has two new Image Comics series launching in the coming months: 8house: Arclight, a miniseries with artist Marian Churchland (who is also Graham’s wife), and Island, a new oversized comics magazine he’s curating with Pretty Deadly artist Emma Rios. Graham is doing really great stuff in comics, so I highly recommend checking out anything with his name on it. Booty Jermaine needs to protect: staves, medallions, cups, goblins, dormant djinn, grimoires, hard drives. “They can’t cross the circle. It’s made from dad’s old shaman-blessed, sage-infused salt. “We did this when we wanted to make room for dessert!” Margaret probably cleaned up a lot of vomit in that house.